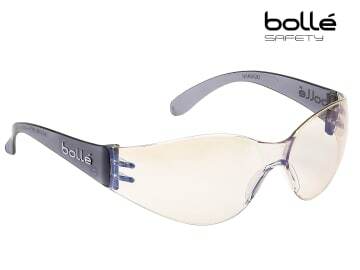 The Bolle BANDIDO Safety Glasses have ESP (Extra Sensory Perception) lenses. This is an innovative coating to reduce dazzle and the harmful affects of blue light. The ESP coating filters: 57% of blue light, 99.99% of UVA/UVB and transmits 64% of visible light. Lens Type: ESP, Anti-Scratch and Anti-Fog. Lens Conforms to: EN1661FT/EN172-Solar 5-1.4.